I have talked before about the work of chemical engineers in pharmaceutical production and the important role they fill in scaling-up lab designed drugs to produce them in large numbers, for example ‘Designing future medicines – the work of the chemical engineer’. However, biochemical engineers also play a key role in using small quantities of materials to identify the critical points of manufacturing in a technique called ultra-scale down. 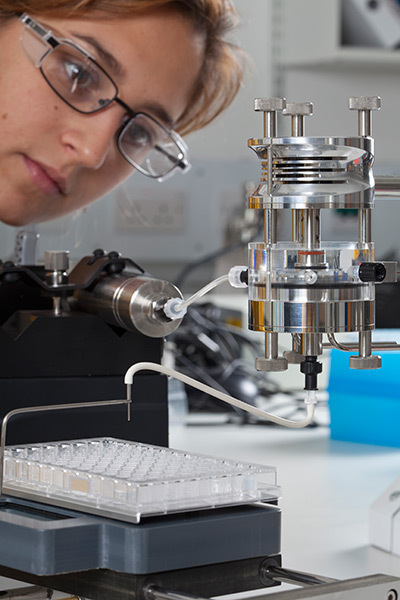 Many pharmaceutical companies are now using this UCL (University College London) technology to speed up the time taken to produce new drugs, leading to big savings. Ultra-scale down uses small quantities of materials to predict what will happen during large scale manufacturing and offers a way of doing so that is comparably quick and cheap to implement. UCL say that over 40 companies have now used the ultra-scale down technologies. For example, pharmaceutical giant GlaxoSmithKline (GSK) have integrated ultra-scale down to its in-house production. GSK is using this technology to help increase their understanding of how to improve their processing of products and reduced the critical path of product development. Using this biochemical processing technique helps ensure that GSK only selects viable molecules for development, which can mean the difference between the success and failure of a medicine through the clinical trial stages. Ultra-scale down has also helped the smaller company BioVex get noticed. BioVex, a UK biotechnology discovery company, used ultra-scale down to investigate the processing of a major vaccine candidate therapy, a Herpes Simplex virus engineered to kill cancer cells specifically. In doing this BioVex were able to demonstrate the value of its product and led to BioVex being bought by US company Amgen in 2011 for an estimated £660 million (US$1 billion). UCL is still making sure that ultra-scale down is being put to good use, and it was essential in the development of novel adsorbent materials for bioprocessing for which UCL patented in 2013. This patent is now being used by Puridify, a UCL start-up company, with the aim of offering a ten-fold increase in purification productivity over existing reagents. It is hoped that this will help to increase patient access to drugs by reducing the cost of production. This just goes to show that biochemical engineering techniques can have a huge impact on this industry, whether they are used to scale-up or ultra-scale down production. If you are a biochemical engineer why not get it touch and share the story of your work? The most interesting part about biochemical engineering in pharmaceuticals is that biochemical enginerring academics are talking interest in it unlike conventional chemistry pharmaceuticals. I was involved in the Pharmaceutical Engineering Advanced Training MSc course at Manchester. Although a number of industry chemical engineers were involved in the course the School of Chemical Engineering at Manchester had absolutely no interest in it what so ever.